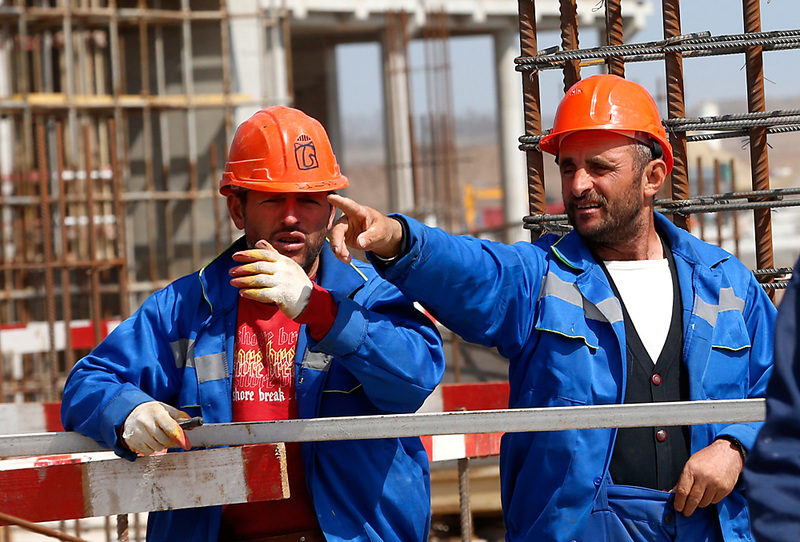 Workers at the construction site of the Yuzhny Airport's passenger terminal in Rostov-on-Don. A report on human rights says there is a large increase in numbers of migrants expelled from Russia. Russia began to get a massive number of labour migrants with the onset of the economic crisis. These people were mainly from the former Soviet Central Asian republics. As the number of jobs has decreased and incomes have fallen, migrants have been left with limited employment prospects, and have started to pose a danger to social stability in the country. To reduce the flow of migrants, immigration legislation was substantially strengthened in 2013, requiring people entering the country to buy work patents and take exams. Those violating these rules are deemed illegal migrants and subject to being removed from Russia. Human rights activists cite Russian government statistics to state that, between 2013 and 2015, courts issued more than 500,000 removal orders. These figures are in a report called "Administrative Expulsion from Russia: Judicial Proceedings or Mass Expulsion?” presented in mid-May by the Civil Assistance Committee. Almost all - 98 percent - of expulsion orders were made under the provisions of two laws adopted in mid-2013. These increased the severity of punishment for violating the rules of entry, residence or employment of foreigners in Russia. In addition, Russia witnessed an increase not only in the number of expulsions, but also in the number of those who were banned from entering the country. By April 2015, according to the Federal Migration Service (FMS), the country had denied entry to a total of 1.3 million people. There are about 10 million migrant workers in Russia now - more than 80 percent of whom are from former Soviet republics; with which the Russian Federation has a visa-free regime. According to human rights activists, officials seek to solve the "so-called problem of illegal immigration" with mass expulsions. Tougher immigration laws, human rights activists say, have become the Kremlin's "main tool in solving domestic and geopolitical problems." The report states that the authorities are responding to demands from Russian society to reduce migration and, by curbing it, put pressure on the countries from which migrants come. The situation must be viewed in the context of the existing visa-free regime with former Soviet republics, as well as previous – not very successful attempts – to control migration, said Alexander Dokuchayev, head of the Diaspora and Migration Department at the Institute of CIS Countries. "By itself, strict immigration legislation is better than no control," Dokuchayev said. "I do not see any other mechanism – we need to get our house in order." At the same time, experts note that Russia's policy for removal and prohibition of entry is quite compatible with worldwide trends. Official European Union statistics, show that 470,000 people across the EU were ordered to leave in 2014. This compares with 600,000 a few years ago. France recorded the highest number of expulsions in 2014 with 87,000 followed by Greece (74,000). The number of people banned from entering the EU is also considerable. In 2014, nearly 300,000 people were refused entry to EU member states. A few years ago, Spain alone refused entry to 510,000 foreigners. In the United States, the figures are comparable with Europe: In 2013, the country removed more than 400,000 people. The Obama administration has totally removed more than 2.5 million foreigners since 2009.